Turtz on the Go: Official AVP for ‘It’s More Fun in the Philippines’ Campaign Released - Newest Province Dinagat Islands Featured! 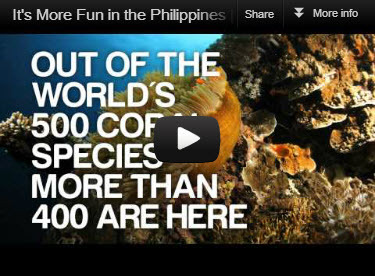 Official AVP for ‘It’s More Fun in the Philippines’ Campaign Released - Newest Province Dinagat Islands Featured! The AVP which runs for 2 minute and 42 seconds features the country’s world famous tourist destinations, festivals, foods and attractions such as the Mayon Volcano in Albay, the Chocolate Hills in Bohol and Boracay, among others. The presentation was quite fast-pacing but if you pause between 26-27 seconds, surprisingly the newest province, Dinagat Islands is being featured there as one of the finest and beautiful islands in the country (see below).